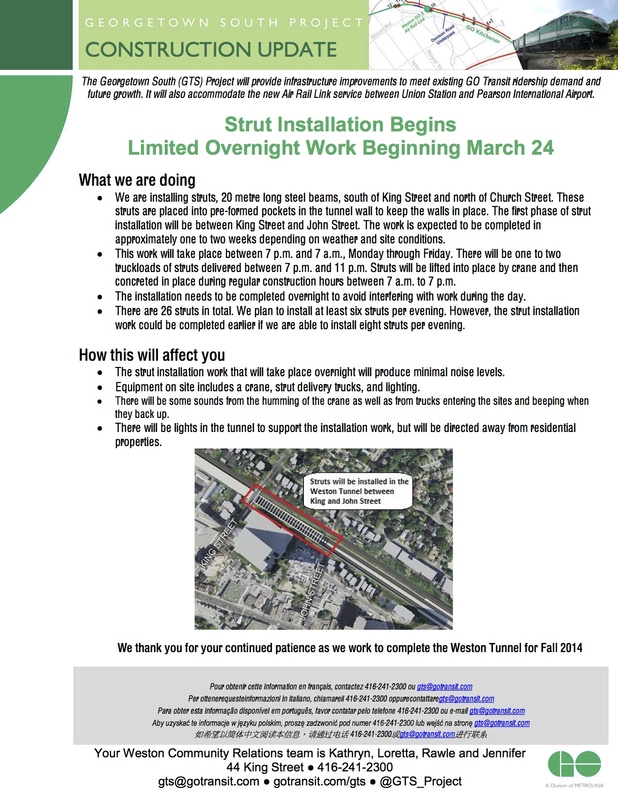 will be minimal noise during the strut installation. The steel beams will come in on one or two truckloads and then be lifted off the trucks into the pre-formed pockets in the tunnel wall. During the daytime construction hours, the struts will then be concreted in place. That sounds really quiet, and especially the parade of cement trucks up Weston Rd endlessly churning. Pretty much like all the minimal disruption this project has caused. This project has not caused me any grief. I don’t get what the complaints are about? Okay so yes the streets and my windows are dirty…..but so what? Its a big project….no wonder nothing gets done in Toronto. Folks should be complaining more about how crappy Weston Rd looks and the wasted money for a “cultural hub” as oppose to a project that’s generating millions in investment dollars. Ever been to anyone’s home at 2:30AM when Metrolinx is pouring concrete several times a week? Ever had to wake up at midnight to stop your kid from crying because they were roused from their sleep frightened because of loud bangs of construction noise? Ever tried falling asleep to that same sound? Or to the sound of breaking rock? Or of rubble and earth being removed from the corridor at 10:30 at night and right down your street? Ever tried eating dinner after work to the never-ending sound of “BEEP BEEP BEEP BEEP BEEP” and the rumbling noises of construction trucks backing up? Ever tried falling asleep to that same sound? Ever woken up to that same sound? Ever tried mourning the loss of a loved one in the privacy of your own home to that same sound? Early morning. Morning. And night. After night. After night. After night. After night. After night. After night. To Metrolinx, a 12-hour working day 6 days a week isn’t enough. Their activities have crept into many people’s private lives where the noise and disruption has deemed many homes an inhospitable environment and continues to unfairly, undeservedly and brutishly upset the lives of many. A lot of things don’t get done in Toronto, true, not because of resident complaints I assure you. In this regard, residents got it right: new transportation, clean transportation, and transportation for the people of the GTA. Not just the business class in the downtown core. Not just the Pan Am athletes who will benefit from organized transportation anyway. Not just the tourists. The collective “We” are paying for a sub-par rail line that our children and grandchildren will continue to pay for and that the majority of citizens in general aren’t going to get much use out of. Sounds like you’re one of the lucky ones who haven’t been assaulted repeatedly by the incessant and indecent amount of noise throughout the night when you just want to relax and get a decent night’s sleep. I truly envy you. The reality is that if you’re not in the immediate vicinity of all the action, it’s understandable that you don’t know what all the complaints are about. But that doesn’t mean others’ complaints you’ve heard aren’t valid. I assure you they are. And the noise factor in particular has many residents suffering through many sleepless and frustrating nights, creating stressful households, and crappy work days as a result because of being sleepless, angry, and stressed because of after hours construction work. And for what? The city of Toronto has by-laws up the wazoo to protect against noise, disruption, barking dogs, loud music after hours…you name it, to keep the peace. Yet the govt message here is “do as I say, not as I do” where they are above the laws they dish out to us, they can do what they want, and not give a crap about respecting the tax payer, working parent, home owner, retiree, or ill who they continue to abuse (yes, it is abuse) by forcing them to suffer at the sounds of their indecency. Their hypocrisy is disgusting. Metrolinx and the CTA say after hours construction is necessary, when in fact it’s all relative, and in their favour. Not ours, of course. It’s not like they are restoring hydro. Or water. Or fixing a gas leak. You know, the things that matter. They are building a rail link to the airport from downtown. That’s it. Sounds great. They can do that during regular working hours. But planned poorly and now they need to save face. Look a little deeper, politically, socially, and economically and it’ll become clear that they continue to waste time and allocate money doing the wrong thing at the expense of many who deserve a hell of a lot better — you know, like the helicopter they hired last year to take aerial pictures of the construction in the tunnel for their website and advertising propaganda, for example. This is why things don’t get done in Toronto. Thank you Pat for saying all the things that need to be said: this whole construction project has been and continues to be a fiasco and a major disruption in noise, debris and destruction — and making moving through the neighbourhood, by car or on foot hazardous and constantly difficult. Where is our MPP — oh, hosting meetings — or our Councillor — oh the cultural hub, “vision” of the future” — when everyone living around this project is ignored. And this is after we had endless meetings with those same politicians expressing concern about noise, pollution, and lace of accessibility to the rail service — and heard promises, listened to Metrolinx PR officers, and got nothing but more grief. Ignored? Invisible? that’s us, until election time when the PR machine springs into action … but real action? No. Nunziata? Albanese? Why aren’t you listening? Albanese just wants/needs to keep her job. As for Nunziata, she’s too busy getting sued (“Tenant sues TCHC, Gene Jones, Frances Nunziata for negligence”, Toronto Sun, online March 12, 2014). First before a human rights tribunal, and now this. The same politician Rob Ford endorses. Go figure. Why don’t we just call this the frances nunziata laura albanese slander and defamation forum. Everyone, pile on now! I’m going to close comments on this thread. Thank you all for your contributions.